If you have been following our website, you’ll see posts by Dr. Guertin and her experiences at the recent Fair Trade Campaigns Conference for Fair Trade Towns & Universities in Chicago. At the conference, all students at Fair Trade Colleges & Universities were issued a challenge, and at Penn State Brandywine, we love a good challenge! We were all asked to take a major step forward with our campus Fair Trade campaigns. It is education and awareness about Fair Trade that changes our purchasing patterns, so we are thoughtful about the impacts we can have on the lives of farmers and artisans. 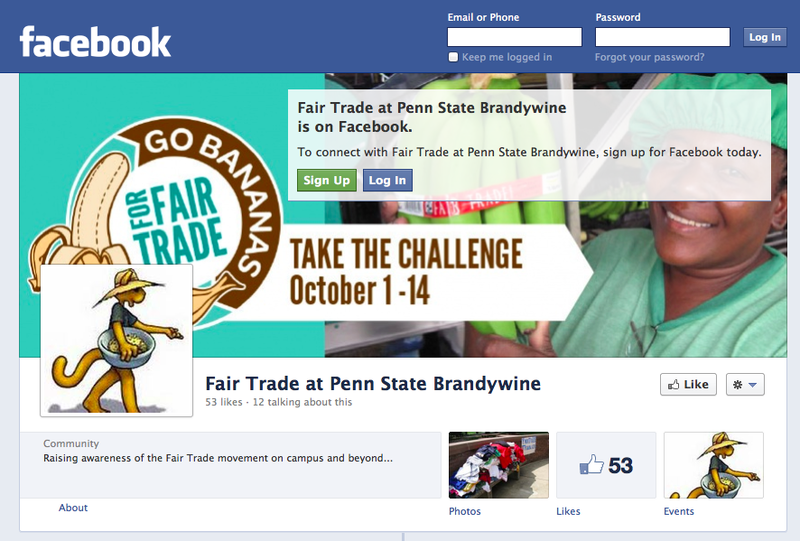 The Penn State Brandywine Fair Trade TrailBlazers have decided to accept Challenge #1, the Social Media Challenge! Fair Trade Colleges & Universities are challenging campaigns to increase the number of people following their Facebook or Twitter pages by 100. 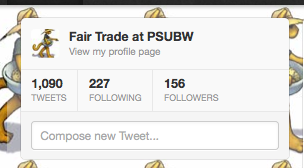 We, the Fair Trade TrailBlazers, have decided to increase the number of followers in Facebook by 100 AND in Twitter by 100! This is where we need your help! If you are on Facebook and/or Twitter, please follow us to learn more about Fair Trade, what we do, and what YOU can do as an individual and with our group to make a global difference. Spread the word to family and friends to follow us as well! This is the number of “Likes”  our Fair Trade TrailBlazers Facebook page had at the start of the challenge (the last day of the conference), October 28, 2012. This is the number of “Followers”  our Fair Trade TrailBlazers Twitter account had at the start of the challenge (the last day of the conference), October 28, 2012. OK, maybe the “education and awareness” side isn’t enough to get you joining us online. How about some Fair Trade chocolate and ice cream? (yum!) For our first 50 new followers in Twitter and 50 new followers in Facebook, each person will entered into a raffle to win a free pint of Ben & Jerry’s ice cream (any one of their Fair Trade flavors)! For all of our 100 new follower in Twitter and Facebook, each person will win a free Fair Trade Penn State t-shirt and a selection of Fair Trade chocolate. Now, we hope we have your attention, and that we can keep your attention, energy, and enthusiasm for Fair Trade. No, Alta Gracia, YOU are the ones rockin’ the #FF on Twitter! Thank you, Ten Thousand Villages of Canada, for the very kind shout-out on #FF! The tweet was posted June 8, 2012.